It’s a billion degrees outside in Los Angeles, and hockey season is underway … what better way to beat the heat than with some quality popsicles? 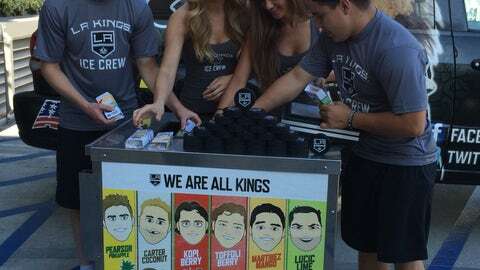 Even better: LA Kings-themed popsicles. 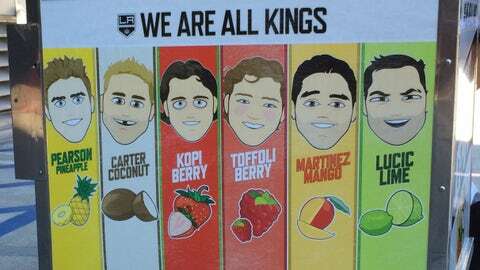 The franchise used cartoon characters from their Kings emoji keyboard created by artist Mike Sofka and came up with fun player flavors such as Pearson Pineapple, Carter Coconut, Toffoli Berry and Lucic Lime. LA Kings’ Ice Crew and mascot Bailey then hit the streets to promote the return of the Kings to the rink (and to FOX Sports West) for another season. The stunt was a resounding success and had fans clamoring for more, said Kings marketing VP Jonathan Love. And who wouldn’t want a cool King pop during a Southern California heat wave? Unfortunately, the icy treats will not be sold at Staples Center or any time during the season. The LA Kings Ice Crew hard at work giving out popsicles at the FOX Sports West/Prime Ticket offices.